Azamara's famous poolside buffet, the "White Night Party", is held once every voyage (weather permitting). Loyal guests know to pack a special outfit for the occasion and to arrive with an appetite. Decks Nine and Ten are transformed into a gorgeous outdoor restaurant, and Azamara's officers and crew serve guests a delectable feast. 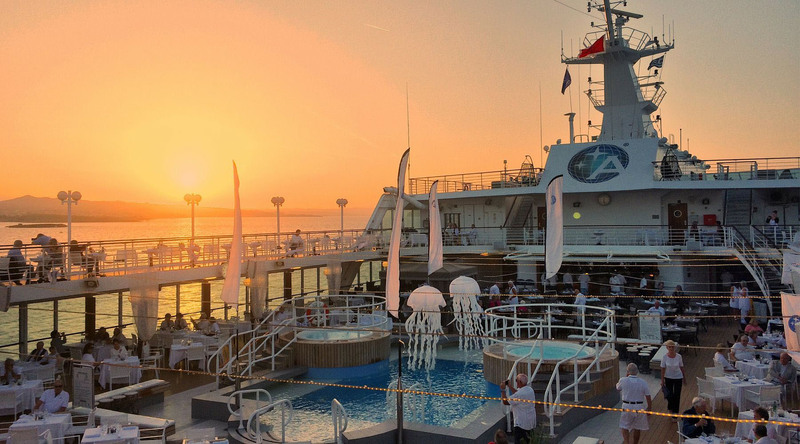 The White Night party on my voyage in November was perfect. The food was buffet style with such a variety of dishes to choose from. The waiters went out of their way to keep everyone’s wine glasses filled to the brim. The saying “I was over-served” may have been accurate in terms of entrees, desserts, and wines. During dinner, and long into the night, the Azamara Quest Band performed all of my favorite songs. We danced and sang along with the band until closing time. Ask any Azamara guest what sets the cruise line apart from others, and they'll tell you it's the wonderful staff and crew. I’d like to share a few pictures of the people who, no matter where I run into them, greet me with a smile. Here is Hotel Director Philip Herbert making his signature dish, Crepes Suzette, during the White Night party. Executive Chef Iwan Pennings seems shy but actually quite an interesting conversationalist, especially when talking about his trade or his love of cruising. First Officer, Simone Patalano, plotting our route on paper charts. Technologically it is no longer necessary to hand-plot the ship’s route but it is a skill the company likes kept sharp. And on this, my first sailing with Captain José Vilarhino, I can testify that he is having fun no matter what he’s doing! He is everywhere, at every party or waiting alongside the ship upon disembarkation in every port. And on this particular voyage, he was especially happy to discuss the 1497-1499 exploration of the Indian continent by his fellow countryman, the Portuguese explorer Vasco de Gama. Here he is in Goa, India. These are just a few of the happy faces I encountered on this 15-day sailing from Dubai to Singapore. If you have a memory of a special interaction with an Azamara crew member, please share your story in the comments! Bonnie MacLaird is Azamara's Chief Blogging Officer. She has worked in the cruise industry for over 20 years and shares a passion for travel with Azamara guests. You can most often find Bonnie offering helpful tips and sharing Azamara news in the Cruise Critic online forum.